The WPA chart took a circuitous route last night. After Nick Swisher struck out to lead off the sixth, it appeared as though the Twins were well on their way to a Game 1 victory. With a three-run lead and one out in the sixth, their win expectancy reached 87.7 percent. Francisco Liriano had just retired his ninth straight batter. The heart of the Yankees order was due up, but none of them had hit the ball particularly hard to that point. But as we so often see in baseball, the game changed without warning. Starting with a Mark Teixeira double, the Yankees chipped away at the Twins. 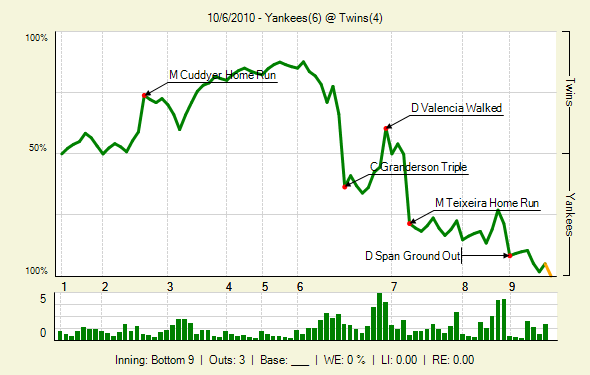 That one-out hit moved the green line 4 percent toward the Yankees side. A wild pitch and a walk moved it another 5 percent. Robinson Cano smacked an inside fastball through the right side to move the green line another 7.4 percent. The Yankees were on the board, but the Twins still had a 71.1 percent WE. A Marcus Thames strikeout moved that to 77.6 percent, but Jorge Posada continued the chipping process with a single to right, moving the line 11.4 percent. Chipping away is all fine and good — old school baseball fans seem to love it. But sometimes you need that big hit to wrap it all up. Curtis Granderson provided that big hit. Liriano had worked Granderson away in his previous at-bat, but finally came inside on the fifth pitch. One inning later he employed a similar pattern, backdooring a slider for strike one and then missing with two fastballs. On the fourth pitch he stayed outside with a fastball, but Granderson was ready. He hit a long, high drive that bounced off the wall in center. The hangtime allowed even Posada to score from first and give the Yanks the lead. Win Expectancy: 63.5 percent, Yankees. Something similar happened in the bottom of the inning. It might not have been as drastic, but just as Liriano faded after some strong work, so did CC Sabathia. He had retired nine straight heading into his half of the sixth, and he quickly made that 11 by getting Joe Mauer to strike out and Delmon Young to hit a heart attack of a fly ball to the warning track. After that point he had lost his command. Two walks and a double later, Sabathia had the bases loaded. That brought the Twins’ WE to 44.6 percent. All Danny Valencia had to do was stand there to put the green line back in favor of the Twins. With the game still tied, there was no reason for the Yankees to chip away in the seventh. Instead, they got the proverbial bloop and blast, though it was more like a sharp grounder and a shuttle launching. Jesse Crain, who had been so dependable for the Twins during the season, had trouble with his command to Teixeira. The first two pitches he threw ended up high; the second one, a curveball, a bit more dangerous than the first. 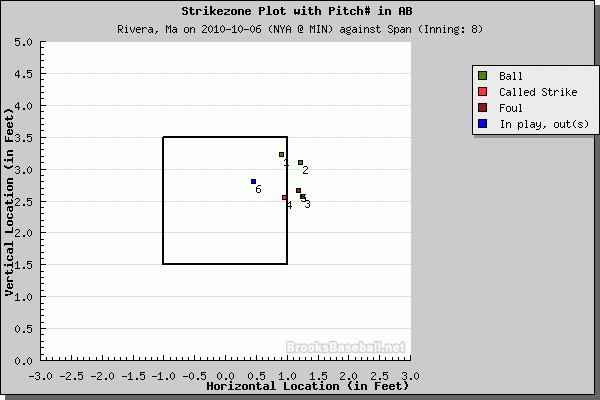 On the next two pitches, both low fastballs, Teixeira took big rips, but managed only to foul them off. Eventually Crain’s high-balling tendency got the best of him. He left a slider hanging and Teixeira lined it up like it was on a tee. The ball barely stayed fair, but when it landed it moved the green line 28.4 percent toward the Yankees’ side. The Twins did mount one final comeback attempt, putting runners on first and second with one out in the eighth. They started the inning with an 18.3 percent WE, but had managed to raise it to 27 percent after Valencia dribbled one past the pitcher. A grounder moved the runners but cost the Twins 5.6 percent in WE. The next at-bat would prove to be the most costly for the Twins. With the tying run on second and with seemingly none of his relievers able to throw strikes, Joe Girardi turned to the one man he knew he could trust. Mariano Rivera warmed up quickly and jogged out to the mound, tasked with retiring four batters. He apparently needed three more warmup pitches, but after that he was fine. He kept pounding Denard Span with cutters inside, and eventually Span did what most hitters do: break his bat and hit a soft grounder. That cost the Twins 13.1 percent in WE at a time when they couldn’t afford to go much lower. The only remaining moment of note came with two outs in the ninth. Young got a good piece of a high cutter and lined it to right. Greg Golson, in as a defensive replacement, came charging and appeared to make the catch on his shoestrings. It was inevitable, then, that the umpire would rule it a trap. That just seems to be the way the umpiring has gone lately. It wasn’t quite the gift that Phil Cuzzi gave the Yankees against the Twins in last year’s ALDS, but it still brought the tying run to the plate. Fortunately for the Yankees, he popped up the first pitch. While the Yankees won, they walked a tightrope for the last few innings. From the sixth inning on their pitchers walked five batters. They also needed to burn their best bullpen arms, and perhaps rendered Rivera unavailable for tomorrow’s game. That’s all secondary to the win, but it could easily work against them in Game 2. We hoped you liked reading ALDS Game One Review: Yankees by Joe Pawlikowski! Did you just say that he might have rendered Rivera unavailable for tomorrow’s game? It’s the playoffs, and Rivera was coming off of 3 days of rest. I’m Rivera is available for a least 4 outs again tomorrow.